Merrick, NY—As if jewelers weren’t already struggling to understand Millennial-age consumers, recent research turned up two opposing views about the importance of diamond origins. Do Millennials really care if their diamonds come from the earth or from a laboratory? Yes, they do. But after that, it gets a little more complicated. Millennials care about ethical sourcing. Unanimously, every consumer research study finds Millennials care about both the social and environmental impact of their purchases in all categories, not just jewelry. Whatever the product, Millennials are far more likely to buy if they feel their purchase is doing good—or at the very least, they want reassurance that their purchase is not doing harm. Being able to demonstrate the good being done by any part of the diamond industry, and how their purchase supports it, is imperative. Mined or man-made? Nearly 70% of Millennial age respondents to a new MVI Marketing consumer research study (conducted online among 1,010 respondents, ages 21-40, from April 27-30) say they would consider a lab-grown diamond for a center stone in an engagement ring. The findings represent a 13% increase from a similar study that MVI conducted a year ago. “Millennials are clearly showing a strong level of interest [in lab-grown stones] and the progression since our 2017 study has been significant,” says MVI president Liz Chatelain. Just over half of respondents indicated they would like to know more about lab-grown diamonds, and just under one-third want to see them with their own eyes. But ongoing research from the Diamond Producers Association says the opposite. DPA’s latest study of a balanced cross-section of more than 1,000 Millennials shows this cohort actually is more likely to buy [mined] diamonds and diamond jewelry than any other age group, and the strongest showing came from self-purchasing women. “Millennials over-index for diamond purchases. They account for 27% of the U.S. population, but 41% of diamond purchases,” said Sarah Gorvitz, DPA head of communications and insights, during a special seminar about its research that DPA hosted at the recent AGS Conclave. Millennials spent $16 billion on diamond jewelry last year, 50% of which was bridal jewelry. But of the other 50% of diamonds bought by Millennials, a full third was bought by women as a self-purchase. Furthermore, says Gorvitz, when women in the DPA focus groups were asked to “sell” diamonds to each other, the most frequently and consistently mentioned attribute in their sales pitches was diamonds’ earthly origins. “It doesn’t matter where you are or what age group you’re speaking to, they all seem to have the same idea,” Gorvitz said. They talk about how diamonds are billions years old, that they're unique, that they're from the earth, and consumers have a perception that diamonds increase in value over time.” Authenticity was the number-one attribute DPA respondents mentioned, she continued. Diamonds’ earthly origins are best suited to represent the most important and authentic moments in consumers’ lives. “Diamonds have fascinated generations with their natural origin, beauty, durability and value: they are finite, billion-year old gemstones. 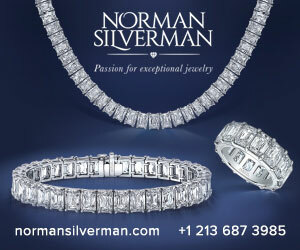 More than just chemicals, diamonds involve preciousness, authenticity, and heritage. Just as one cannot compare an original Picasso to a reproduction, one cannot compare a [mined] diamond to a manufactured replica,” says Jean-Marc Lieberherr, CEO of the Diamond Producers Association. Yet despite these attributes, another 1,000 Millennials told MVI they would strongly consider a lab-grown diamond for their engagement ring if it means they can get a nicer one than a natural stone for the same money. So which is it? What do Millennials really want? Affluence plays a key role. 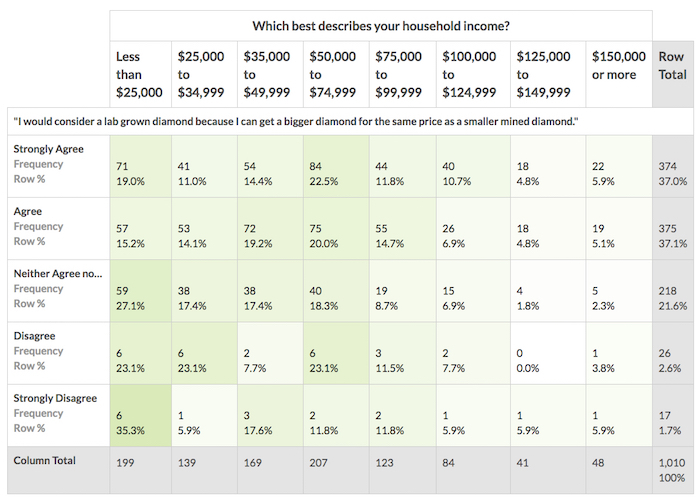 In MVI’s study, most respondents who either “agree” or “strongly agree” with the statement “I would consider a lab-grown diamond because I can get a bigger diamond for the same prices as a smaller mined diamond” had household incomes ranging from $35,000 to $75,000, while the fewest who agreed or strongly agreed with the statement had household incomes between $125,000 and $149,999 or over $150,000. Likewise, the most respondents who said they would consider a lab-grown diamond for an engagement ring were in the $50,000-$75,000 household income group, followed by $35,00 to $49,000, or under $25,000. But among respondents with household income over $125,000 or $150,000, relatively few said they would consider a lab-grown engagement ring. Oddly, however, the number of respondents who said “no, they would not consider a lab-grown engagement ring” also was highest among lower-income respondents, while very few high-income respondents dismissed it entirely. More upper-income respondents indicated they would consider one than wouldn’t. 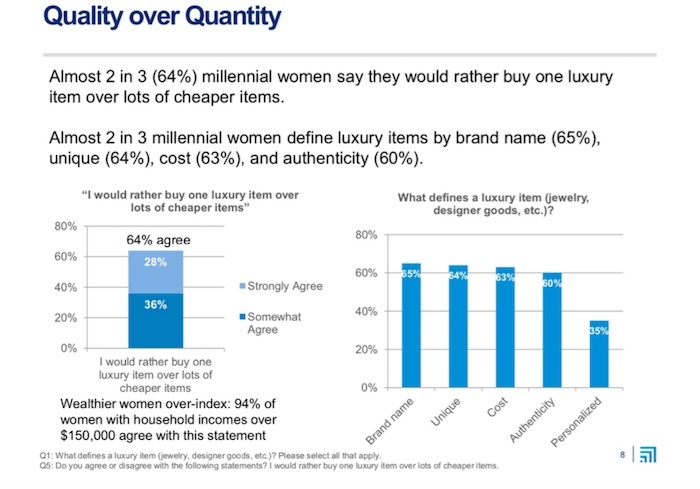 In the DPA’s research (chart below), 64% of Millennial respondents either “strongly” or “somewhat” agree with the statement “I would rather buy one luxury item over lots of cheaper items.” But that agreement jumps to 94% among respondents with household incomes over $150,000. That Millennial women will opt for one luxury item over many cheaper items was perhaps the most surprising disconnect of DPA’s research, given the conventional wisdom about Millennials’ lust for wardrobe and electronics churn-over. But the same consumers that shop in H&M and get a new phone every year also rocketed the minimalist KonMari cleaning method to iconic status. Marty Hurwitz, MVI CEO, believes there’s room for both mined and manmade diamonds in the market, and says the industry’s resistance is only hurting it. The key, says Hurwitz, is not discounting the product. As everyone in the industry knows, discounting has done tremendous damage to the image of diamonds already, but it’s easy to flip that negative perception on its head by positioning the manmade stone as a bigger stone for the same price rather than a cheaper version. “Don’t reduce the budget the consumer wants to spend. Just show that for the cost of a half-carat mined stone you can get three quarters or a one carat in lab grown,” says Hurwitz. Furthermore, he believes it helps drive up prices for mined diamonds as those get positioned as the “trade up” luxury alternative. Jewelry By Designs offers Pure Grown brand lab-created diamonds. But jewelers willing to offer the choice remain in the minority. In May 2017, DPA surveyed 250 jewelry retailers across the country, a mix of owners, sales managers, and sales associates at both independent and chain stores. At the time of the survey, a large majority of retailers did not sell lab-grown stones and did not plan to introduce them. The main concerns expressed by respondents were reputational: fears that selling lab-grown diamonds would be perceived as offering imitation diamonds or [costume] jewelry and/or would diminish the store’s reputation as a high-quality store, or that it might devalue their natural diamond offerings. One of the sticking points for many jewelers is the fact that synthetics don’t increase in value and, as production costs decrease, may even come down. Meanwhile, DPA’s research shows consumer perception of [natural] diamonds as a store of value is as strong as ever. But Hurwitz points out that mined diamonds don’t necessarily increase in value the way consumers assume they will. Certainly, some do—mainly large, D-flawless, or costly fancy colors—but the typical diamond engagement ring might at best return full credit toward another purchase while the cash-out value will be much lower, he says. Related: Diamonds Or Mutual Funds? How To Have The Investment Conversation With Your Customer. “Stores that are putting these side by side are doing really well giving the consumer a choice,” echoes Hurwitz. “Any other consumer goods, the story would have evolved already by itself. The fact that this is even a debate is fascinating and that people are factionalizing like Republicans or Democrats is amazing. We’re in the love business and this is an opportunity! We shouldn’t be factionalizing or putting up barriers to consumers. “Jewelers are really struggling with getting younger consumer into jewelry stores. Having something new that they find interesting is important. For whatever reason, they’re already interested in this and want to see it. 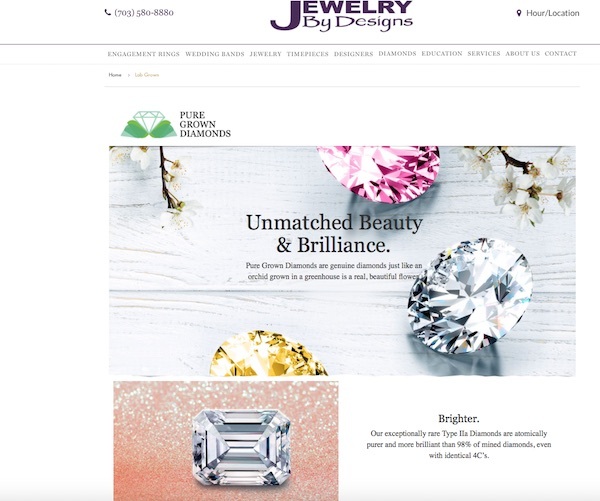 If a Millennial walks into a jewelry store and wants to see it, and the store says ‘I don’t have it,’ or ‘That’s crap,’ what a turnoff it is!” Furthermore, he says, that kind of attitude is likely to turn the customer off to all jewelry stores, not just that particular store—creating even more incentive to shop online and bypass the brick-and-mortar jeweler. Along with cost, social and environmental issues are key drivers for Millennials considering lab-grown stones. While not all lab-grown stones are eco-friendly, Hurwitz says many growers (especially U.S. companies) are transparent about their energy use and what it takes to make the stones. With a meticulous chain of custody among ethical growers, retailers who are concerned about offering only eco-friendly stones have a reliable supply, says Hurwitz. Meanwhile, the mined diamond industry also is focusing on ethical supply chains and telling the positive stories behind diamonds, emphasizing economic development, environmental conservation, education, clean water, and health care as just a few of the advantages diamond mining has brought to nearby communities. A well written and researched article on an emerging industry growth opportunity. I am waiting for the next article that will articulate the supply side eventually result of lab-grown diamonds. 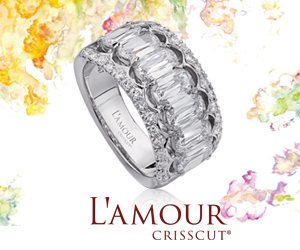 The cutter and polishing industry could grown from 25 thousand plus or minus to over 250 thousand as lab grown diamonds and their inevitable growth continues to climb. It takes the same skill, equipment and ability to polish diamonds as it does gem quality diamonds and lab-grown diamonds for industrial use. It is this expanded market, industrial use where the economy and job growth o the supply side will present a real wind fall for several countries currently engaged in the diamond cutting and polishing markets of today.